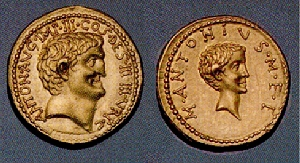 Mark Antony Junior was the son of Mark Antony and Fulvia, his first wife. Little is known about this once potential heir of Rome, but that he was executed at Alexandria after his father’s death by the orders of Octavian. The unpopularity of his mother Fulvia, no doubt left little good will toward the young man despite the fact that Octavian had at one time been married to his half-sister, Claudia.